You don’t have to be a geek to setup FreedomBox! When people think of servers, they imagine a big machine or a large stack of them making humming noises and furiously serving millions of requests. 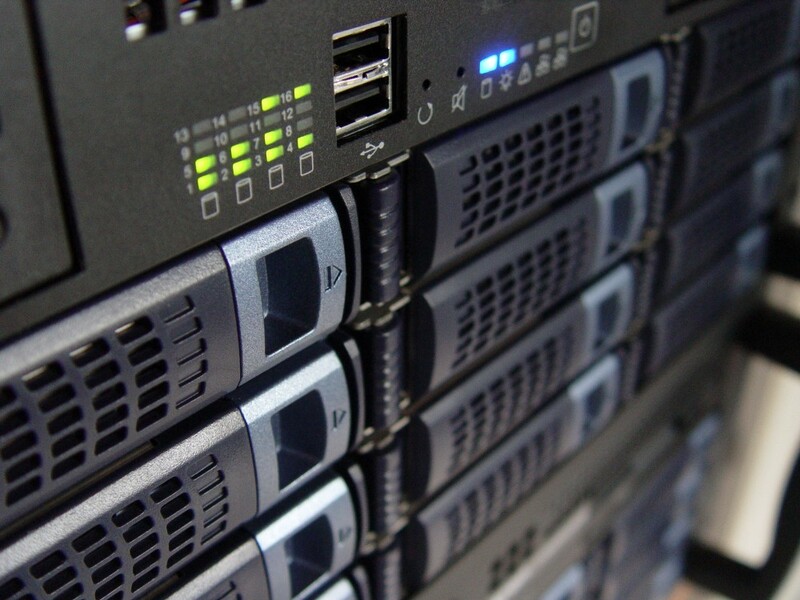 A server can also mean a computer program that is continuously running, listening for client requests and serving them. Think Apache, Nginx or Tomcat. When someone says that they have gone serverless, what they actually mean is that they are no longer running a software program listening to requests. There should still be a physical computer of some sort serving the requests of the clients. The premise of serverless is that you don’t have to keep a computer program called a server continuously running to serve your clients’ requests. When a request comes in, a small program (maybe a single function) gets invoked, serves the request and terminates. Serverless (not running server programs) is the goal and Function as a Service (FaaS) should be considered one of its implementations. Are microservices and P2P applications serverless too? Not really. A lot of microservices use HTTP for communication and thus have a server component in them. A P2P application (e.g. Syncthing, BitTorrent) acts as both the client and the server and hence doesn’t need a server decoupled from the client. Now that you know what serverless actually means, it’s time to learn more about it. I recommend starting with this blog post by Badri Janakiraman. Ad blocking on Android is a huge mess. On the Firefox browser for mobile, we have ad-blocking add-ons but for ads in the apps, there’s nearly no good option other than to use ad-blocking proxies. Installing a proxy on the phone itself might drain battery as it has to be running continuously. This article explains how to use an ad-blocking proxy server on your LAN instead of installing one on your phone. Privoxy is an ad-blocking proxy server that can filter ads from web content automatically. It’s also highly configurable. If you have one Privoxy server running on your LAN, either on your home network on a device like the FreedomBox or on a desktop machine that’s up all the time, then you can use Privoxy to block ads on your Android device. 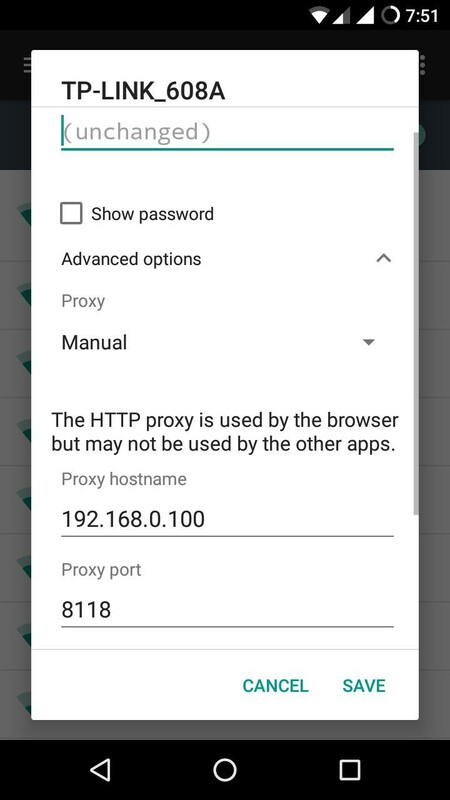 Set a static ip address for the server running Privoxy on your local network and set it as your proxy in your Android settings as shown in the following screenshot. Here’s how you reach this screen. In Android Settings, go to Wi-Fi. Click on Advanced Options in the pop-up that opens. Set the Proxy hostname to the static ip address of your Privoxy server. Privoxy’s default port is 8118. Now, your Android device no longer suffers from ads as long as it’s connected to this network. This was really useful for my tablet at least, since it almost never leaves the house. You can also use Privoxy as a proxy server in Firefox settings to avoid sites forcing you to whitelist them in ad-blocker settings. If you want an ad-blocking proxy on your phone, which doesn’t always stay on the same network, you can use the Android apps DNS66 or Blokada. In the beginning there was FORTRAN. Programming was done line by line with each line printed on a punch card. There were no conditionals, only GOTOs that pointed to line numbers. This is where statements in programming came from. Then there was structured programming (like in C). Structured programming introduced blocks and kept the statements and GOTOs. GOTOs were slowly thrown out as they were too troublesome. Functions and Structs came to be defined in terms of blocks. Then there was object-oriented programming. Blocks and statements were kept, and GOTOs were mostly discarded. State and functions were bundled together into objects. functional programming which offered modularity on a whole different level. Before Alan Turing was defeating the Nazis with his legendary computer, his teacher Alonzo Church invented a mathematical formalism known as the Lambda Calculus — a formalism that only consisted of the lambda character (duh! ), names and expressions. Before C with its blocks, pointers and functions was invented, a computer scientist named John McCarthy wrote a paper that axiomatically defined all of programming in terms of just 7 operators. An implementation of these operators on the machine was done and mostly used for List Processing came to be known as LisP. A function in Lisp is a lambda expression bound to a name. Nope, no statements, only expressions. Entire Lisp programs were just expressions. Then came ML, Haskell, OCaml, Scala, Clojure, F# etc., but the concept remained the same. They used expressions, not statements. Expressions in programming originated from mathematics, whereas statements in programming exist because we were line-feeding the FORTRAN code of yore and are stuck with our old habits. Old habits die hard and sometimes they last generations, like the QWERTY keyboard layout that makes no sense to use on modern computers. On the positive side, we should probably be happy that we let go of the punch cards that we were writing our statements on. Disclaimer: This article is written like a story. There’s no guarantee of factual or chronological correctness. In the past few years I tried out multiple To-Do list apps like Todoist, Pomotodo, Trello (which was a bit of an overkill for this purpose) etc., and finally settled on Google Keep for personal tasks and Emacs Org-mode for work-related To-Do lists since I do all my work on my work laptop and wouldn’t need mobile synchronization for it. Recently, I was looking for a non-cloud alternatives for most of my cloud-based apps, basically to reduce my dependence on the entire Google suite of apps. I installed F-Droid and tried a few Free and Open-source (FOSS) apps. 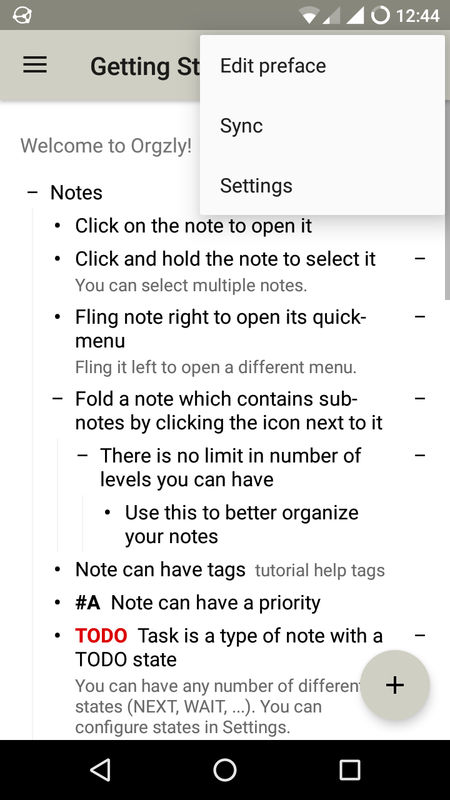 One app called Omni Notes looked exactly like Google Keep and I was using it for a while, till I discovered Orgzly. Orgzly is basically an emulation of Emacs Org-mode on the mobile. This means I don’t have to use two kinds of apps for my To-Do lists. I can write my To-Do lists in Emacs and edit them on the go on my mobile. This sounds a lot like Microsoft Word for Windows Mobile, doesn’t it? Well, I was looking for a FOSS alternative. Now the whole problem is syncing my notes. I could have hosted NextCloud on a Raspberry Pi at my home and set it up with Dynamic DNS and used it to keep these in sync. But that’s a lot of work and needs additional hardware. Instead, I decided to use a peer-to-peer synchronization tool called Syncthing. 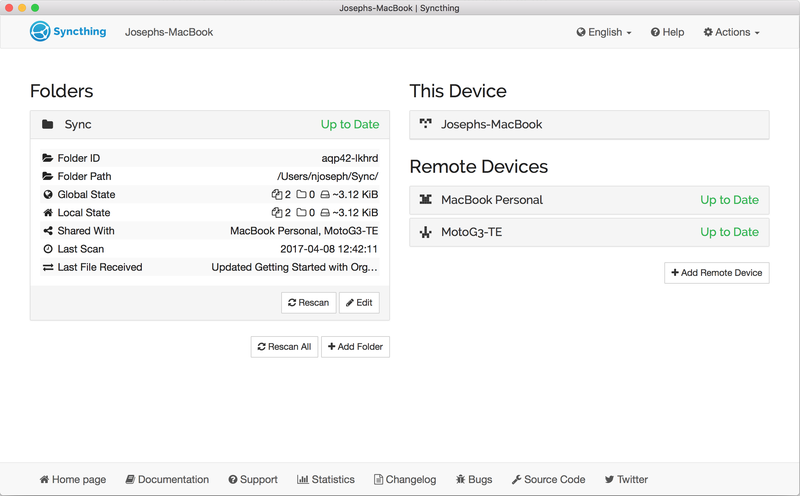 Syncthing is very easy to use and has both desktop and mobile apps. I created a folder called ~/Sync on my laptop and moved my Org-mode lists there. Then, I setup Sycnthing to sync that folder to the mobile device. Orgzly has a sync feature. I just had to point my Orgzly to use Syncthing’s folder on the mobile device and select “Sync”. Syncthing did its job of getting my notes from desktop to mobile and Orgzly displayed them in Org-mode. What is this FreedomBox thingy? See this 4-minute video to learn what it is. Apart from the privacy-enabling stuff, it also has a chat client, web-based bit-torrent client, blogging software, ad-blocking using proxy server, file synchronization, a social networking server, VoIP server etc. It’s a convenient little thing to have, with lots of utilities. Disclaimer: I didn’t mean to write a tutorial, but just to explain how I setup my FreedomBox. I felt that there might be a lot of people like me who may find this useful. I’ve used a MacBook and a Raspberry Pi in my setup process. Also, tried it on two different routers. Please take my advice with a pinch of salt. This is neither official nor recommended. In this setup, the FreedomBox acts as a home server connected as just another device to the router. The FreedomBox can also act as a router which can have some additional benefits. Put the SD card of your Raspberry Pi into a card reader and connect it to your laptop. There’s a nifty little utility called Etcher which can quickly get the above image installed on the memory card, in just 3 steps. Insert the SD card into the Raspberry Pi. We’re done with FreedomBox installation. This is where the Wi-Fi router comes in. Connect your Raspberry Pi to the router using an ethernet cable. Connect to your router’s web interface using some URL like 192.168.1.1 or 10.0.0.1. Try both 1.1 and 0.1 with both the series. For D-Link routers, the default username is admin and the password field must be left blank. If you’re in Hyderabad and using the ACT FiberNet’s router like me, the default username is admin and password is radinet_admin. Search on Quora if these don’t work for you. There are some other combinations. See the connected devices on your router and find the FreedomBox’s IP address. Hit that IP address in your browser. You’ll see a warning that the connection is not secure, click the “Advanced …” link and proceed for this time. Now you’re on the Plinth interface of FreedomBox. You can access the FreedomBox when your laptop is connected to this router, but not from the internet, well not yet. To access it from the outside, you need to do port forwarding. Follow this process: - Find the static DHCP settings on your router, and define a static IP address for your FreedomBox’s mac address (your router will show the mac address as well). I set it whatever the FreedomBox’s current IP address was. - Next, find the setting called “IP forwarding” or DMZ on your router and add your FreedomBox’s static IP address there. - Then, find the setting called “Port forwarding” on your router and enable port 443 (the port for HTTPS connections). Now, if you know your public ip address (a simple google search will tell you), you can go to https:// and reach your FreedomBox. But that ain’t as cool as what we’re gonna do next. Go to FreedomBox’s plinth web interface, login (or create a new account if setting up for the first time) and click on the Configuration tab in the menu bar. You should see an option called Dynamic DNS Client on the left. There you’ll find some instructions, but basically it tells you to go here and register for a dynamic DNS. Choose the domain “freedombox.rocks” for extra awesomeness! Once you register a domain there, like joseph.freedombox.rocks, it might take a few minutes to actually start working. Then you can just use a URL like https://myname.freedombox.rocks and access your FreedomBox from anywhere. This domain name will also be necessary when setting up federated applications on the FreedomBox. Not just you, but you can create as many user accounts as your Raspberry Pi can support for your friends and family and have secure communications and some cool utilities all hosted on a credit-card-sized computer! Congratulations! You have setup your own FreedomBox and may have turned a bit geeky as a side-effect.